It was a very snowy Preston last Wednesday which probably explains why there was a delay to some of our members arriving. It was soon concluded that it was again too cold to undertake a washout on FR 20’s boiler. However, the weather had not deterred Martin Clark who had driven down from Richmond, via a very bleak Stainmore summit, to see us and deliver some books for the sales stand. 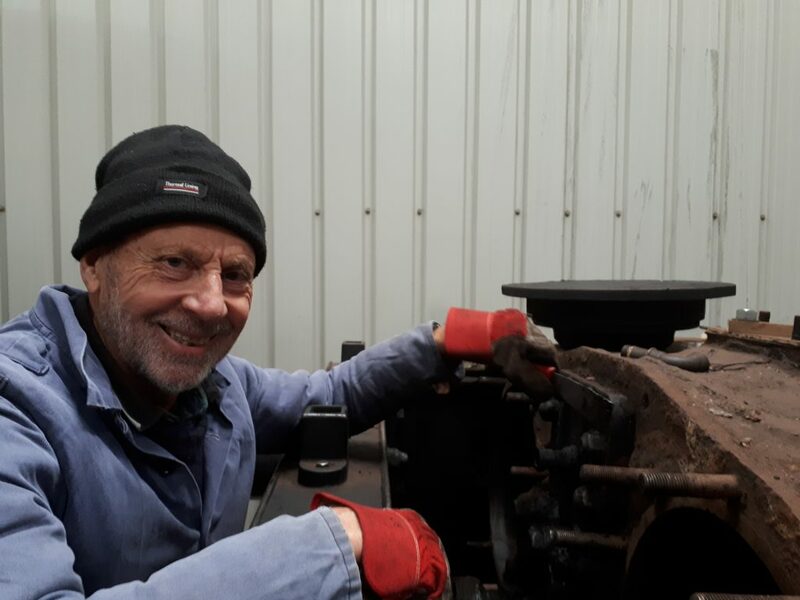 There were still plenty of other jobs to undertake in the comparative warmth of the shed so Martin was put to good use after making that effort to come, and is seen here cleaning the accumulated dirt and oil from around the front of FR 20’s cylinders and valve chest. 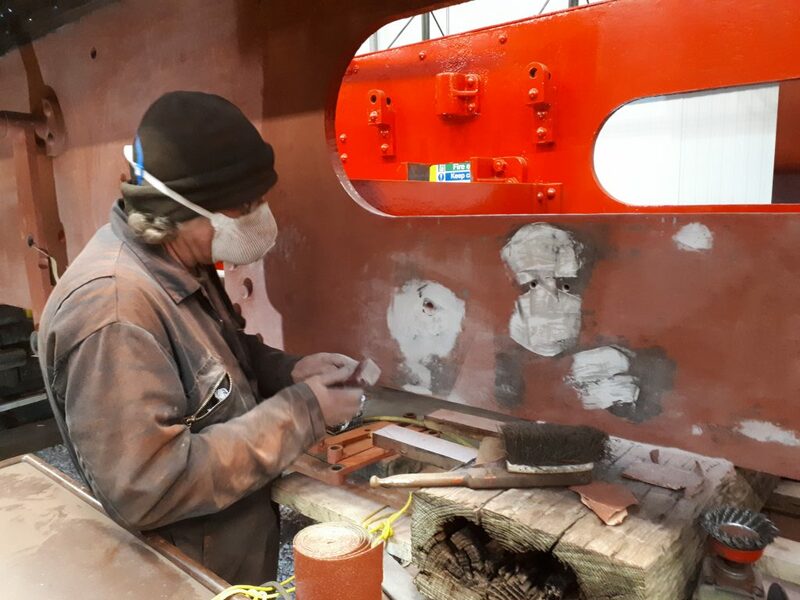 John Dixon test fitted a former for the future construction of a brick arch in FR 20’s firebox and Tim continued the task of cleaning and painting FR 20’s wheels. Continuing the theme of cleaning and preparing were John Dixon and Roger who blitzed FR 20’s drag box. 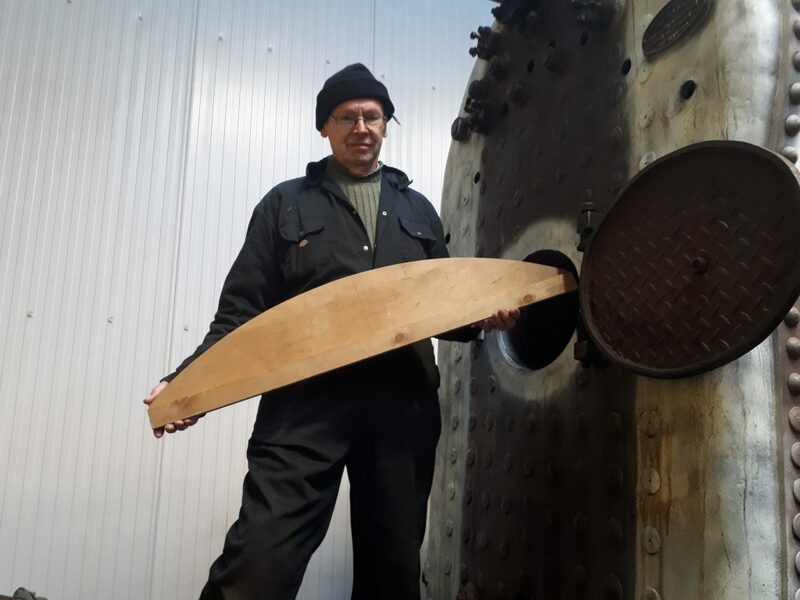 It is strange to recall that for some months the engine’s drag box acted as a store for the vast array of nuts and bolts that was used during the loco’s restoration in the Engine Shop at the Barrow Shipyard more than 20 years ago! Ade continued his laudable work on Caliban‘s frames by filling and sanding various indentations. Fred took on the task of cleaning rust from Caliban‘s buffers whilst Keith prepared brackets to hold the injectors on Wootton Hall and Bob continued his task of poring over drawings for the Hall, sensibly in close proximity to the kettle in the warmth of the mess room. Derek paid a visit to do some more filming of the work being undertaken and Mike Rigg appeared with a prospective new member who was being shown around the site. John Davis was also busy on both Wednesday and Friday working on Fluff‘s frames. And finally, a recent visit to Embsay by experienced boilersmith Graham Beddows had confirmed that it would be sensible at this stage to replace three stays in 5643’s firebox above the firehole door. 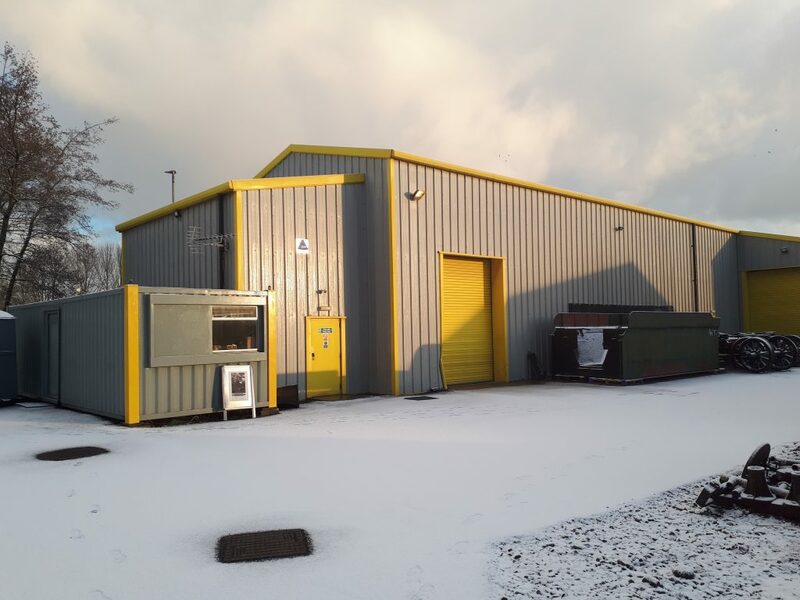 With this in mind, Keith and George were planning to meet at Embsay on Saturday to remove pipework and cladding so that access can be gained to undertake the task.